‘Tis the part of a wise man to keep himself today for tomorrow, and not to venture all his eggs in one basket. Low correlations form the bedrock upon which the concept of diversification rests. The idea is that by diversifying, an investor gets a benefit — reduced risk at no loss in returns, or higher returns at the same level of risk. In this post, we review correlations among top crypto assets, and traditional asset classes, and discuss how these insights can be used to construct more efficient portfolios. In a prior post, we developed a Decentralization measure for the crypto economy, and observed that Bitcoin’s market share has been falling over the last few years. We expect this trend to persist as new blockchain projects build upon the innovation sparked by Bitcoin, and the crypto economy continues to decentralize into a multitude of projects/networks. It is crucial then for an investor to explore the benefits of diversifying their portfolio. This post offers insights into how an investor can reap the benefits of diversification in their crypto portfolio, and across traditional asset classes like stocks and bonds. Crypto assets have relatively short price histories which makes quantitative analysis challenging. To construct an objective sample of coins for the analysis, we include coins that have grown to current market cap of over $2 billion, and have at least 2 years of price history. As a result, some of the younger coins, like Cardano and Bitcoin Cash are excluded. We also exclude coins like Tether that do not have free floating prices, i.e. prices are pegged to another asset, currency or commodity. The table below lists market caps at the end of May 2018, and number of months of price history available, for the assets included in this analysis. Unless mentioned otherwise, throughout the rest of this post we use last 2 years (June 2016 to May 2018) of daily returns history of the coins to measure their investment efficiency. Although some coins have longer history available, we use only the last 2 years of data to ensure consistency in the analytics. Correlation measures the strength of the relationship between two variables. Correlations range between +1 and −1, where +1 is a perfect positive relationship, 0 is no relationship, and −1 is a perfect negative relationship. 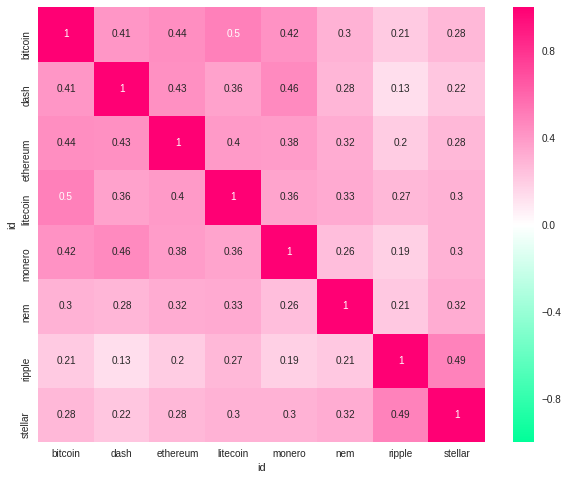 The following heatmap renders correlations among daily returns for the coins in our sample. 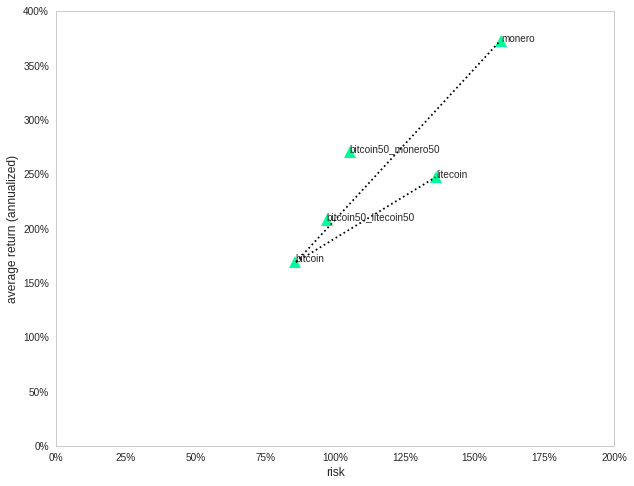 The first thing we observe is that all the coins have positive correlations. This is typical of assets in the same asset class — returns of a stock are typically positively correlated to other stocks, and returns of a bond are positively correlated to other bonds. All coins are, obviously, perfectly correlated to themselves so the correlations on the diagonal are always 1. A deeper look tells us that not all the correlations are equally strong. Litecoin has the highest correlation with Bitcoin at 0.5 — this makes intuitive sense as both projects are decentralized payment networks. Similarly, Monero and Dash — both focused on financial privacy — correlate on the high side at 0.46. Ripple and Dash, given the different problems the two projects focus on, have the lowest correlation at 0.13. How stable are these correlations? Correlations do increase during periods of market stress but they are less than perfect, i.e. they do not rise to +1, so diversification continues to provide value. Investment return is the investor’s compensation for taking risk. An investor has the choice to invest capital in any available asset(s). As such, return-risk ratio is a simple and effective measure of investment efficiency that allows us to compare various alternatives available to an investor. Risk is computed as the standard deviation (stdev) of daily returns. Note: Sharpe ratio is a more robust and broadly accepted measure of efficiency in finance literature. Given this analysis is over a short period of 2 years, we simplify the return-risk ratio by excluding the risk-free rate component. Both risk and returns are annualized — daily returns are multiplied by 365 — for standardization. Although all coins in the sample delivered exceptional returns, there are stark differences both in terms of the magnitude and efficiency of returns. Bitcoin, which spawned the crypto revolution, delivered 169% average return at 86% risk (standard deviation) resulting in an return-risk ratio of 1.97 (169/86). Monero was the most efficient with 372% annual return and a return-risk ratio of 2.33. Stellar had the highest average return at 463%, with a return-risk ratio of 2.11. Litecoin was the least efficient of the lot with a return-risk ratio of 1.81. How do correlations impact crypto portfolio efficiency? To illustrate the benefit of less-than-perfect correlations we construct two simple equal-weight portfolios: one with 50% Bitcoin and 50% Litecoin, the other with 50% Bitcoin and 50% Monero. The portfolios are constant-weighted, i.e. the weights of the assets are re-adjusted daily to 50% each. The return of the combined portfolio is the average of the returns of the individual assets, but the risk is lower than the average risk due to less-than-perfect correlations between the two assets. This improvement in risk-adjusted return is effectively captured by the return-risk ratio. The return-risk ratios of both these portfolios are superior to the individual coins they are composed of . Over the 2 year period, the Bitcoin+Monero portfolio delivered a return-risk ratio of 2.57 which is 10% higher than Monero’s 2.33 and 30% higher than Bitcoin’s 1.97. The risk-return ratio improvements in the Bitcoin+Litecoin portfolio are not as dramatic due to the higher correlation between the two coins, but they are not shabby either — the portfolio had a return-risk ratio of 2.15 which is 9% higher than Bitcoin’s 1.97 and 19% higher than Litecoin’s 1.81. Another way to observe the efficiency improvement is from the risk and return chart below. The bitcoin+monero portfolio’s return/risk sits higher than the dotted line that connects bitcoin and monero. The distance of the combined portfolio from the dotted line is a visual measure of efficiency improvement — the farther the combined portfolio from the line, the greater the improvement. With around $300 billion in total market cap, crypto is very small compared to traditional asset classes like stocks, bonds and gold where majority of world wealth is invested. It is worth exploring then whether crypto provides diversification benefit when combined with traditional asset classes. 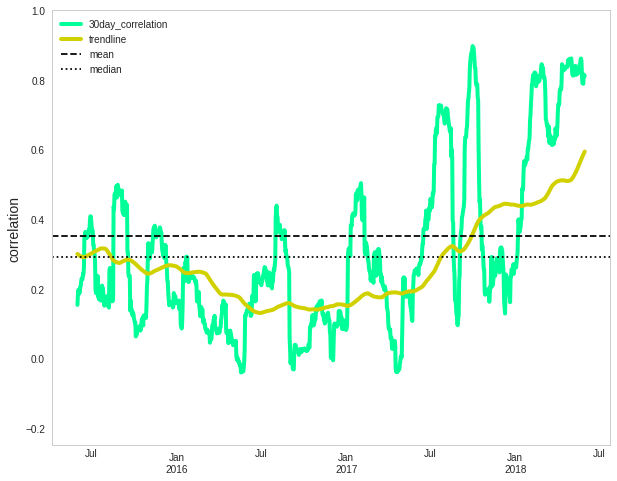 We use daily total returns of global stocks, global bonds, and gold for the analysis — the MSCI ACWI index represents global stocks, and Bloomberg Barclays Global Aggregate Bond index represents global bonds. Correlations: Correlations between crypto and other asset classes are very low, many of them near-zero. This creates a tremendous opportunity for diversification across crypto and these traditional asset classes. Efficiency: Below panel of return-risk ratios demonstrates the efficiencies of traditional assets classes over the two year period. Stocks delivered the highest return-risk ratio at 1.56, followed by gold with a significantly lower 0.37. Bonds performed poorly in this environment where interest rates have been rising — bond prices and interest rates move in opposite directions. We have been using last 2 years of price history for this analysis because of the short crypto history available, but there is several decades of data available for traditional asset classes. The table below lists the return-risk ratios of stocks, bonds and gold from Jan 1991 to May 2018 (over 27 years). It is important to note that returns and risk for traditional asset classes have been significantly different over the long run compared to the recent two year history. Just like they do in crypto, returns, risk and correlations vary over time in all asset classes, so any historical analysis is better appreciated with the usual cautionary note — past performance is no guarantee of future results. The table below lists return-risk ratios of the individual asset classes and the 3 portfolio combinations. The stocks+bonds portfolio delivered 8% return at 6% risk with a return-risk ratio of 1.45. In comparison, the introduction of gold in the stocks+bonds+gold portfolio reduced risk but also reduced return, delivering a slightly lower return-risk ratio of 1.41. Replacing the 5% gold allocation with Bitcoin doubled the return to 16% whereas the risk increased marginally to 7%. The significant return enhancement with a small risk increment resulted in a far superior return-risk ratio of 2.32 which is a 60% improvement over the 1.45 delivered by the stocks+bonds portfolio. The portfolio efficiency improvement can also be observed in the chart below where the stocks+bonds+bitcoin portfolio sits at a significantly higher return/risk compared to the other two portfolios. It is not very often that individual investors get the opportunity to participate in the formation of a major asset class — not one asset but an entire asset class that has the potential to transform finance and investing. For context, stocks have been trading for over 400 years. The first recorded IPO (initial public offering, not to be confused with ICO, initial coin offering) occurred in 1602 when the Dutch East India Company offered its shares to the public. 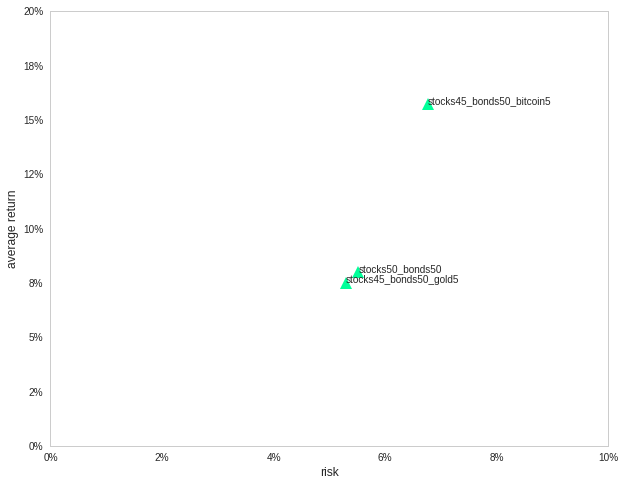 Of course, the potential for high returns is accompanied by significant risk. Crypto investors can benefit from the less-than-perfect correlations among crypto assets. Diversifying across multiple coins has shown to improve portfolio efficiency. For investors in traditional asset classes, small allocations to crypto assets enables them to access the hyper-growth in an asset class which is still in the early stages of formation. Allocations to crypto have shown to be a source of uncorrelated returns that can materially enhance the risk-adjusted return of the portfolio. We at Ethos.io are working on solutions that will make the benefits of diversification accessible to every investor, through a financial ecosystem that is open, safe and fair for everybody. As part of our mission we plan to launch our Universal Wallet in the Netherlands, coincidentally the home of the first IPO. This post is for educational purposes only and should not be considered as investment advice or a recommendation of any particular asset, strategy or investment product. The author may or may not own or have owned the assets referenced and if such assets are owned, no representation is being made that such assets will continue to be held. Acknowledgements: Many thanks to to Aidan Gordon, Andrew Carpenter and Dan Caley for their valuable feedback, and for helping build the analytics.